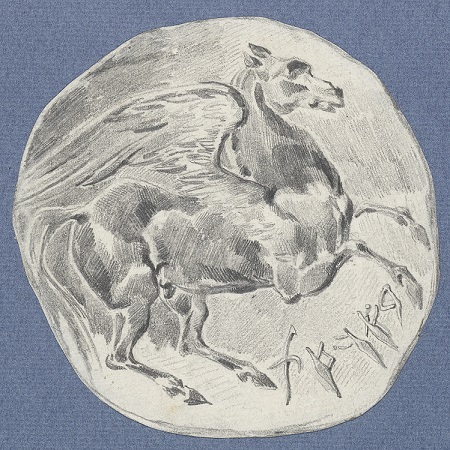 I have 2 favorites to share before my own take on Pegasus: Chèvrefeuille’s beautiful Hippocrene-inspired image and Haiku Plate Special’s charming reminder of the way I and so many others were introduced to Pegasus. Perhaps the image credit requested by the Rijksmuseum refers to a likeness of Persephone on the other side of a coin? Perhaps some copy-then-tweak editing did not go far enough? A magic spring with water that ensures complete editing would be a worthy companion to Hippocrene. Haha! Yes, your haiku rules (I say this as I duck!). The Haiku Plate Special doesn’t follow the 5-7-5 rule you’re always pushing….what gives? Hey, respect (not worship) for 5-7-5! I don’t worship anything. Not even sweet potato fries. Come to think of it, the 3-5-3 form U mentioned long ago would work well here. Now I must go get my beauty rest.